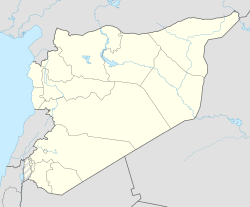 Al-Shaddadah or al-Shaddadi (Arabic: الشدادي‎, Kurdish: Şeddadê) is a town in southern al-Hasakah Governorate, northeastern Syria. The town is administrative center of the al-Shaddadah Nahiya consisting of 16 municipalities. At the 2004 census, al-Shaddadah had a population of 15,806. As a preliminary result of the ongoing Syrian Civil War, it today is situated in Jazira Canton within the autonomous Federation of Northern Syria – Rojava framework. The town's name might be derived from "Shadadu"; a governor of the district of "Suru" mentioned in the annals of the Assyria king Assurnasirpal II. The town is situated off the western bank of the Khabur River. Nearby localities include al-Sabaa wa Arbain to the west. In the course of the Syrian Civil War, the city was attacked by the al-Nusra Front in the February 2013 Battle of Shadadeh and was captured 3 days later. According to the Syrian Observatory for Human Rights, over 100 Syrian Arab Army soldiers and 40 al-Nusra fighters were killed, as well as dozens of petroleum workers. The city was later controlled by the Islamic State of Iraq and the Levant and as of late 2015 remained one of the last ISIL strongholds in the province. On 24 November, it became known that ISIL militants were transferring their family members further south to eastern Syrian Deir ez-Zor province After the SDF captured the South Hasakah Dam on 30 November, they continued their offensive southward, towards the city of al-Shaddadah, now ISIL's last stronghold in al-Hasakah province. Subsequently, Arab tribal leaders reportedly urged ISIL to withdraw from the city "peacefully," in order to prevent civilian casualties and the possible collapse of the economic infrastructure in al-Shaddadi, if a destructive battle between the SDF/coalition forces and ISIL were to occur. It was also reported that ISIL was beginning to evacuate some of its positions near al-Shaddadi, and that some ISIL militants were moving their families from the area to ISIL-held territories in the Deir ez-Zor Province, in preparation for the upcoming battle. On 19 February 2016, the town was captured by the Syrian Democratic Forces (SDF). On 21 January 2019, US and Kurdish SDF forces were attacked by a VBIED. ISIL claimed responsibility for the attack through an affiliated news service. None of the American service members were injured. ^ a b "2004 Census Data for Nahiya al-Shaddadah" (in Arabic). Syrian Central Bureau of Statistics. Retrieved 15 October 2015. Also available in English: UN OCHA. "2004 Census Data". Humanitarian Data Exchange. Retrieved 4 December 2015. ^ "Town of Shaddadi encircled by SDF from three sides". ANF News. 19 February 2016. Retrieved 10 April 2016. ^ Albert Ten Eyck Olmstead (1918). The Calculated Frightfulness of Ashur Nasir Apal. p. 241. ^ "Syrian rebels say capture eastern town of al-Shaddadeh". Reuters. 14 February 2013. Retrieved 24 October 2015. ^ "ISIS militants evacuate their families from major stronghold in Hasakah amid dramatic progress by Kurdish-Arab alliance". Ara News. 24 November 2015. Archived from the original on 2015-11-26. Retrieved 5 December 2015. ^ a b c "As Kurdish-Arab alliance prepares to storm Shaddadi, tribal leaders ask ISIS to withdraw to avoid civilian casualties". Archived from the original on 2016-04-15. Retrieved 2015-12-05. ^ "الشدادي محررة" (in Arabic). Hawar News Agency. 2016-02-19. Retrieved 2017-03-02. ^ "ISIS car bomb targets US troops in Syria one week after four Americans were killed in Manbij". Retrieved 2019-01-24. This page was last edited on 24 January 2019, at 19:23 (UTC).